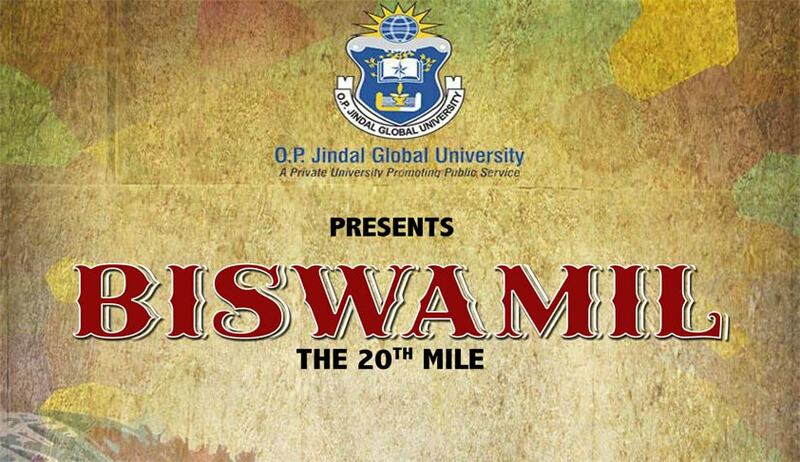 Jindal Global Law School is organizing the annual extravaganza called Biswamil , is a colloquial term for the 20th milestone, signifying University’s location, which is 20 miles from New Delhi. JGU believes that every university has a distinctive cultural setting and JGU location on the outskirts of N.C.R puts us in a microcosm of Indian rural life, with its rustic charm and local flavor. Besides celebrating the beauty of this vibrant lifestyle, JGU seek to send out a social message. The theme of the festival revolves around the vibrancy and simplicity of rural India. The aim is to bring forth the various spinning colors of the Ferris wheel, the excited chimes of laugher, the mirth, the joy, the balloons soaring high up in the sky to transform Jindal campus into a dynamic and cheerful rendezvous, akin to a mela or village fair. O.P Jindal Global University, SonipatNarela Road, Near Jagdishpur Village, Sector 35, Sonipat, Haryana 131001. The last date for submission of the “Confirmation Form, “Participants Details Form and the registration fee is 4th September 2015, by 5:00 p.m. In order to participate in the flagship events, fill and submit (send it through mail) of the confirmation form and participant details form is compulsorily required. There is no on the spot registration for flagship events, therefore, it is mandatory to confirm your participation in the flagship events by filling and submitting the confirmation and participants details form before the deadlines. All requisite details i.e name of the events and participant should be correctly entered for the accuracy of information on certificates. Additionally they should be identical to that on their Student ID. Any difference must be notified before hand, and will be permitted at the sole discretion of the Organizing Committee. The list of participants entered in the “participants Detail Form” will be regarded as final, and no further changes will be entertained. The number of male and female support staff members must be clearly mentioned on the confirmation form. Such members will also be responsible to pay the participant’s fee. Participation in Biswamil 2015 will be confined solely upon the payment of total participant fee. The details of mode of payment are encloased for perusal. Subsidized participants fee is Rs 1500 per head, which is inclusive accommodation, breakfast for 4 days and local transport facility. The amount is non refundable. Payment shall be accepted in the form of “demand draft “ in favour of O.P Jindal Global University, payable at Sonipat, India or direct transfer in bank account of JGU (details of bank account mentioned below). All details and original demand draft should be sent by 4th September 2015 at : Finance Department, O.P Jindal Global Law University SonipatNarela Road, Near Jagdishpur Village, Sector 35, Sonipat, Haryana 131001, NCR of Delhi, India. The event based registration fees is required to be paid n the day the fest begins and not with the fest registration fees (which is mandatory required to be sent beforehand to confirm participation in the fest, either in form of demand draft or by direct transfer to the University’s bank Account. th September 2015, 5:00 pm. It is essential that entire contingent arrives JGU in one group, on 8th October 2015 by 4:00 pm, positively. The opening ceremony shall be orgainsed from 5:00 pm onwards on 8th October 2015 at JGU. Attendance at the opening ceremony is compulsory for all participating teams. The university /college/ institution Identity cards of all teams will be checked during the registration, and should be carried by each participant. Without which no participation, in any flagship or side event, would be permitted. Every university/ college/ institution is required to have a designated “CONTINGENT LEADER”. All information /communication relating to Biswamil 2015 will be routed through Contingent Leader and he will be responsible for all the actions of the participants during the course of the tournament. Every Contingent member/ participant must carry his/her college ID card at all time during the course of the tournament. All Contingent members/ participants must adhere to the rules and regulations of JGU while present within the premises of the university. Consumption/ possession of any intoxicant, inclusive of liquor, or smoking is strictly prohibited within the campus and accommodation site. If a participant is found violating the rules, it would lead to the disqualification of the participant, who would also be required to leave the premises immediately. Rules listed are subject to change at any time as per the discretion of organizing committee. Details rules and regulation about the events, duly approved by the Biswamil 2015 Organizing Committee shall be provided to each time in the Hand Book upon the successful completion of the registration process. In cases of dispute of any kind, the decision of the JGU Organizing Committee will be final and binding. For further details regarding the rules and regulation of the each events and accommodation click here.